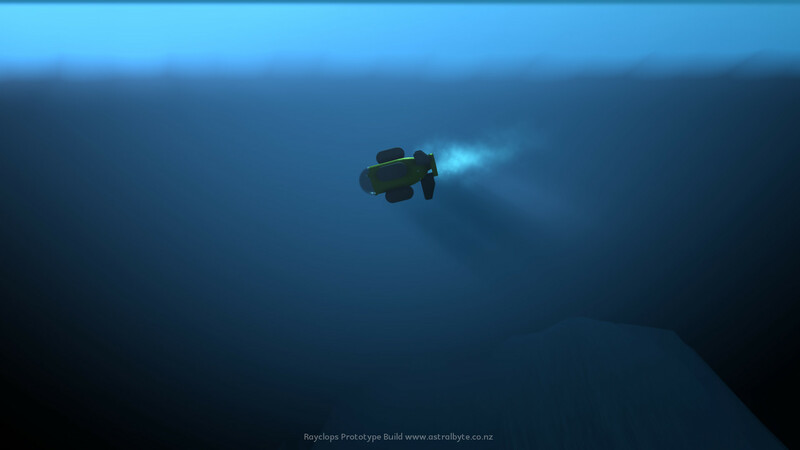 Rayclops : Submarine Architect | Astral Byte Ltd.
Rayclops is a submarine construction and exploration sandbox simulator. 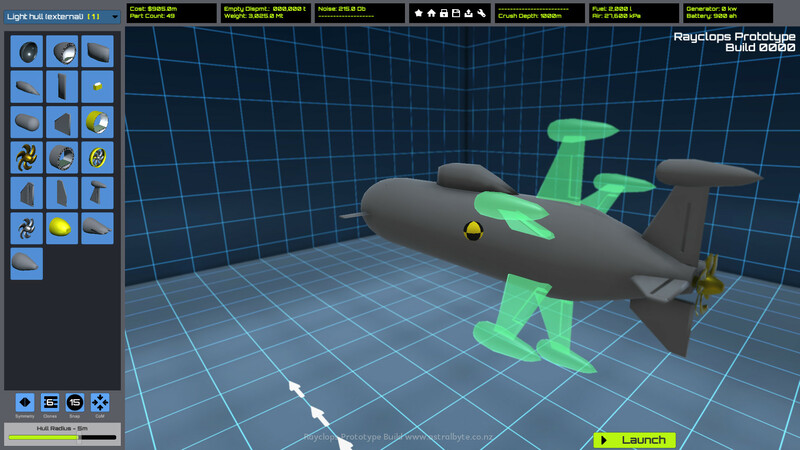 The player chooses what type of contracts to accept from combat to science. Once accepted, they must constructs a sub to match the requirements. Upon success, the rewards can be money or reputation. This then in turn is used to unlock more technology. Will the game be combat or science focused? Yes. The game is designed so the player can choose what contracts to accept. Each contract will have unique requirements that must be met. As expected, many combat missions will not only require weapons capabilities, but very low noise equipment. Conversely, science missions will require instruments to perform tests as well as dealing with deeper ocean pressure. 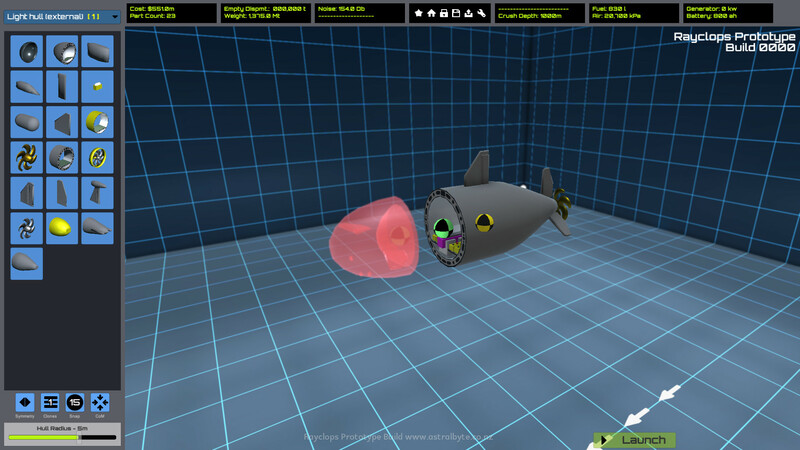 Additionally, the player may choose to perform salvage operations to supplement their income. 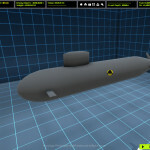 How does the player create submarines? Parts are snapped together in the shipyard. Each part adds weight and affects the centre of mass. This must be balanced by placing ballast tanks or the sub will not be able to surface. External parts also produce drag and require more power to push the sub. Sections can be reinforced using bulkheads but doing so takes space and adds a lot of extra weight. Finally, changing to internal view to place systems like batteries and carbon dioxide scrubbers. How does the player progress? By completing contracts the player will earn money and reputation. This will allow them to unlock new technology and improve their existing designs. 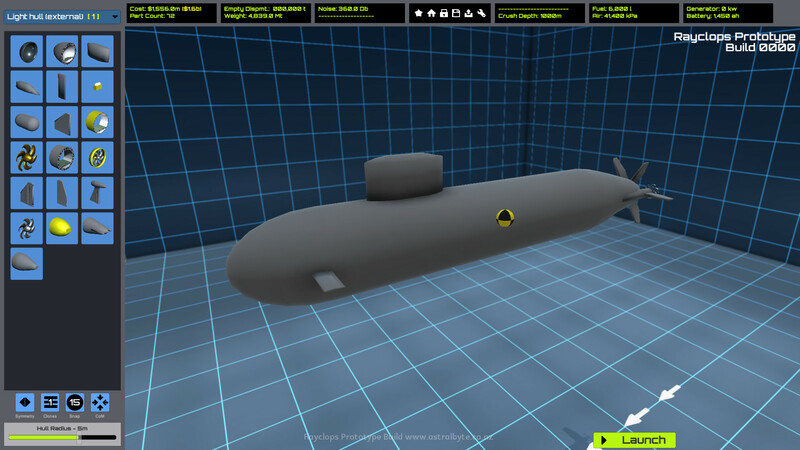 This sounds a lot like Kerbal Space Program, but with submarines. Yes, I have spent hundreds of hours enjoying KSP and it was a great inspiration. The ocean is a wondrous place full of life and discovery. More people have set foot on the surface of the moon then have been to the deepest depth of the ocean. Additionally, it will have combat for those looking to spice up the sandbox experience. Will the game have multiplayer? There are no plans for multiplayer at this time. 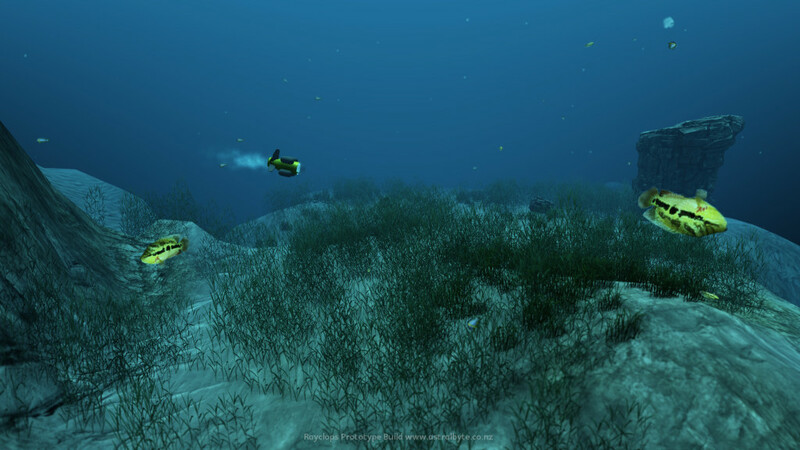 Due to the nature of the game using physics simulation, a smooth multiplayer experience would be very difficult to accomplish. 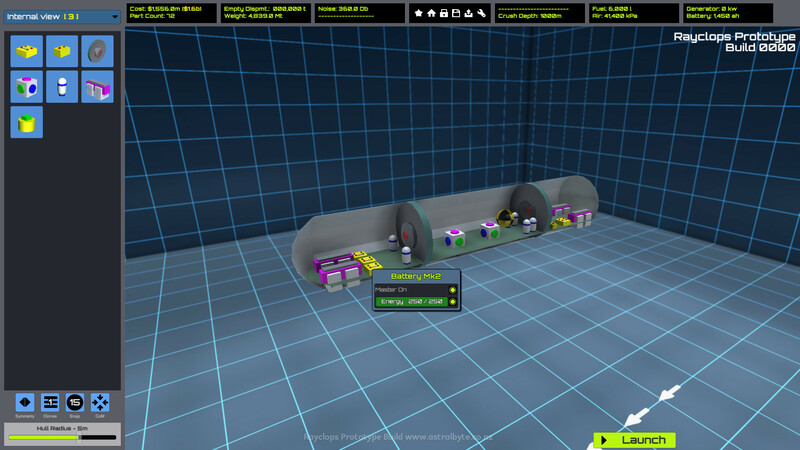 However, the game is designed with the ability to share your creations via a built in workshop. What does the name Rayclops mean? It is a mix between Manta Ray and Cyclops, a common genera copepod. When will the game release? 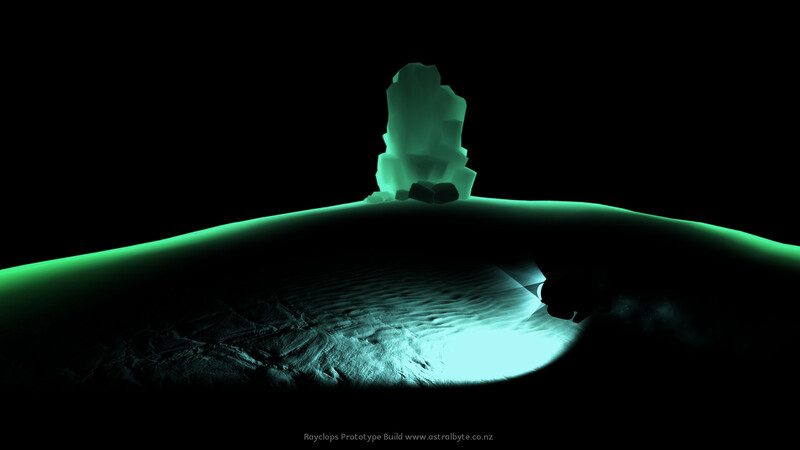 The game is still at a early development stage and no release date has been set. What platforms will it be released? My current targets are Windows 7+ (DX11) and Linux. Can I download it now or sign-up for alpha/beta? I’m not ready to release a public alpha at this stage. Please keep checking back and I will have more information about it soon.